Steel fireguards made to order. LAY-BY available. Order now and pay it off over summer to avoid the lengthy autumn queues! New Zealand nationwide­. CREDIT CARD FACILITIES AVAILABLE. Despite being custom made and powder coated, our fire guards are not expensive. Call or email us today with your hearth measurements for a quote. Our fireguards are safe and durable. Because our fireguards are custom made, they will fit your hearth and look great. Also, because of our unique design there is no pesky bar across the gate opening, getting in your way! Our many great reviews speak for themselves. Single gate unless quoted otherwise (photo 1 shows double gate). Standard height 730mm unless quoted otherwise. Check out our fireguard made to suit Pyroclassic with wooddrawer! We flat pack our guards and deliver nationwide. *plus RURAL DELIVERY $8 PLEASE NOTE your local rural delivery subcontractor may refuse to deliver items over 1.5metres in length. In that case, you will need to collect the fireguard from a courier depot or agent. No rural delivery fee would apply. Good product and good Service. easy to deal with. Awesome Fireguard, fits perfectly and looks great, thanks so much! Great fire guards its exactly what we wanted, very well made. So Thank you very much. Great fireguard, made perfectly and means I feel safe to have the five grandkids around. 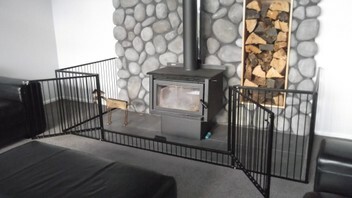 We are very pleased with the fire guard we received from this company. It fits perfectly, looks good and their service was excellent. Competitive pricing too! Quality work. We required a few one off features and Kylie and Stephen made sure they got our fireguard just right. We love our new fireguard, it fits perfectly and looks great. Very impressed with pre-sale communication and attention to detail, also post-sale instructions. I looked at other suppliers that were both cheaper and more expensive but are sooooo glad I picked Stephen Moore as I am rapt with my fireguard. Great service, we have just had a custom made fireguard and it looks great. We were kept in touch with the progress from start to finish. A quality item from a quality company. Highly recommended. Excellent service all the way from go to delivery at my home. Great product, highly recommend to others looking for such a product. Not only is the fireguard excellent, but they provided quick and efficient no hassles communication throughout - sadly this is lacking with most companies these days.. Fantastic customer service! Could not fault the communications and quality of the work, only wish every company worked this way. Thanks.